1. 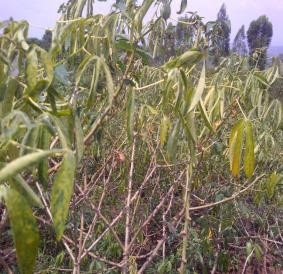 Initial situation: The variety named Sawasawa the most popular and the most common in the Ruzizi plain appreciated by farmers, had lost its performances (resistance to diseases, pests and higher efficiency) and became very sensitive to brown streak of cassava without leaving the slightest chance to farmers to harvest usable roots. The situation is critical and rapid intervention has been indispensable in order to overcome this crisis which would lead to a food disaster. 2. Action taken: for the sake of bringing a palliative solution to this scourge, a series of training of farmers on “management of pests and diseases and the rapid multiplication of healthy cassava cuttings” was organized before the distribution of healthy cuttings of the improved variety (Nabana) was done in December 2014 in the Ruzizi plain (Kamanyola, Katogota, Luvungi, Bwegera, Kiringye, Luberizi, Sange, Runingu and Kiliba). More than 850 farmers benefited from this new planting material, among them are those who participated in one of the trainings on management of cassava cultivation organized by IITA through the SARD-SC project. Each beneficiary received 125ML that can cover an area of 625m2 each. 3. Current situation (outcome or result): Six months later, after visiting the fields of cuttings of the beneficiary farmers, we were impressed not only by the state of the fields but also and especially by the good testimonies of farmers among which Ms. Vumilia of Luvungi said “We thank IITA through its project SARD-SC for assisting us with this new planting material. We were at the point of abandoning the cultivation of cassava due to lack of variety that can resist to the famous brown streak disease”. Ms. Zuwena of Runingu who sees the real Business in the sale of cuttings also said “With this new material that we call Nabana which means the mother of children, we hope again to resume life normally. 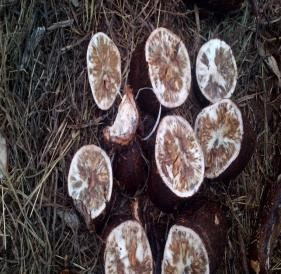 The fact that I am among the primary beneficiaries of these cuttings here at home, is a great salvation for me and for my family, because cuttings of this variety are very well-sought after by NGOs. It is now or never that I must take this opportunity to implement all the knowledge gained on quick healthy cuttings propagation and make a real source of income to meet the needs of my family". 4. 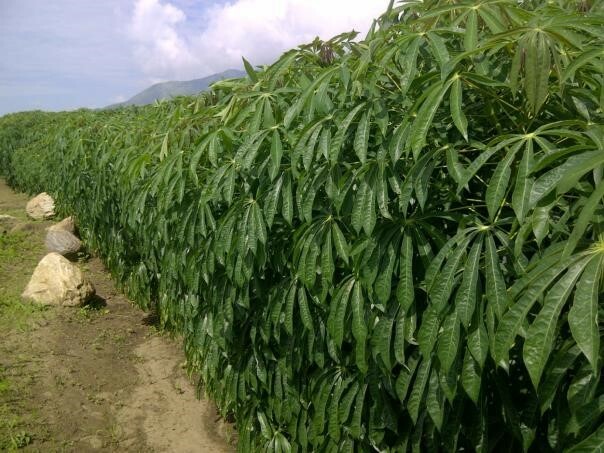 Perspective for the future of the beneficiaries: the departure fields set up by farmers from the received cuttings were regarded as fields of cassava production and not as fields for the propagation of cuttings. Later on, they realized that they could have enough material for planting to cover their needs from their small fields as witnessed by Mzee Adji , the head of the Muslim community in Luberizi. He said “as the needs are huge, I would do the coppicing (phased cut of cuttings) instead of permanently harvest the field to have roots, this will allow me to have more material to cultivate more space in less time”. If IITA could do this first step with other farmers in the middle, which had not benefited from this planting during the first distribution, because at 6MAP there are already some people who envy my field and come to steal the cuttings, I regret this, he added in conclusion. 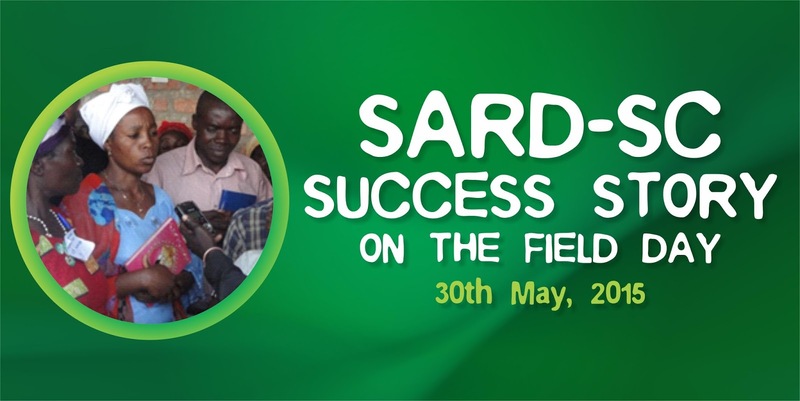 As part of SARD-SC's contribution to farmers in achieving its goals and objectives, we share a testimonial from Mrs. Badesire Mastaki who is a farmer in the site of Miti and also a member of the Association called APSKA, which was invited to attend a field day organized by the SARD-SC Project IITA in February 2015. Attracted by the Intercropping culture system, she went to apply the system at home. She says: "I had cultivated 1.2 hectares of cassava in pure culture with all that this includes as maintenance work in the first months. When I participated in the field day, I understood that it was possible to capitalize on the space between two rows of cassava. I had already planted with spacings of 1m x 1m. 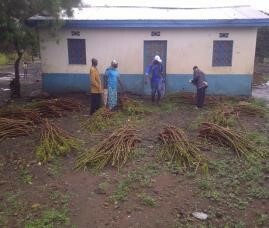 After weeding, I added 2 bean rows between 2 cassava lines". 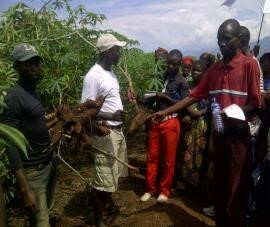 She had already received training on good cassava cultural practices. Hence she was able to take care of the cassava in mono-cropping. She added by saying, "this association has significantly reduced the number of weeding while the bean was cultivated. I just collected 846kg of beans that I never had and which I will use to buy myself a motorcycle and give to my son (19 years) to earn some money during the holidays in order to pay fees enrollment for himself and his four brothers. " Note that a motorcycle assigned to public transportation daily pays $ 8-10 / day. This boy is going to work for 3 months and will generate about $ 700-900 during this period. This is enough for meeting the education needs of 5 children in public schools in the village. "Another part will be used to purchase a few ruminants for breeding," she added. And when Ms. Mastaki was asked about her impression for SARD-SC project, she said, "SARD-SC iishi sawa laki"; to say that SARD-SC live longer as the lake. Failure to sufficiently consider gender will bring only partial success to SARD-SC’s efforts to transform sub-Saharan Africa’s wheat sector. Without properly considering the role of gender issues in technology design, for instance, the benefits of subsequent technologies may be limited in their abilities to equitably benefit men and women, and may even exacerbate inequalities and the workload of women. Considering gender issues in technology dissemination is equally important – this process needs to respond adequately to gender specific limitations, roles, and opportunities to help increase adoption and impact. 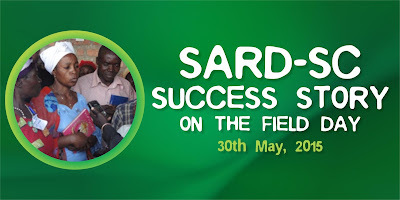 Acknowledging this, SARD-SC (Wheat) recently held a workshop in Sudan – an effort to ensure the initiative gives gender issues the highest priority, and the needs and requirements of women producers are adequately reflected in on-going activities. Reflecting the initiative’s multi-disciplinary nature, the workshop brought together some 50 participants from 12 countries, including wheat breeders, socio-economists, agronomists, and monitoring and evaluation specialists – in addition to gender experts. Discussions focused on opportunities for integrating gender into the projects’ three main components: generating agricultural technologies and innovations; the sustainable dissemination and adoption of agricultural technologies and innovation; and capacity strengthening. Other issues were also highlighted: strengthening the role of women in postharvest and processing; access to technologies and innovations in different cultural and social contexts; the limited number of female extension agents – and the difficulty this presents in terms of promoting and disseminating new innovations to women farmers; and land ownership, overwhelmingly dominated by men. Solutions to these problems were discussed and potential interventions identified. These included sensitizing male extension agents on the importance of involving women in their knowledge and technology dissemination strategies, and a focus on land management rather than land ownership, which would help create a space for women's inclusion. 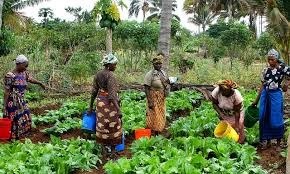 In many countries across sub-Saharan Africa some areas of land are jointly managed by women and men; while others are managed by men or women exclusively such as kitchen gardens. The demonstration of wheat varieties and related technologies on joint plots - rather than plots managed exclsuively by men - would therefore benefit both men and women and allow for the dissemination of technologies to both. The workshop also provided an opportunity to reflect on the status of women farmers across some of the countries where SARD-SC is working, and included presentations on experiences in Sudan, Nigeria, Kenya, and Ethiopia. The presentations provided an update on SARD-SC impacts. In Sudan, where 43 percent of participants are female, women have been successfully incorporated into value-additional activities, for instance. Similar achievements have also been accomplished in Nigeria, where women have initiated small-scale enterprises to produce bread and other baked goods. 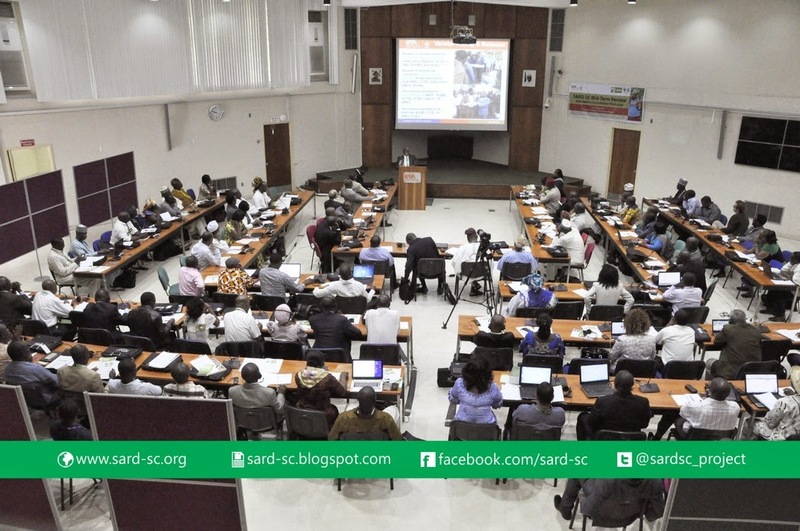 The IITA Management has commended the SARD-SC project, funded by the African Development Bank (AfDB), for its highly satisfactory implementation of all aspects of the project and the meaningful impact the commodity value chains are making in the lives of the targeted project beneficiaries. Dr Nteranya Sanginga, the Director General led the management team comprising of Mr Kwame Akuffo-Akuto- Deputy Director General of Corporate Services, Dr. Yiva Hillbur – Deputy Director General of Research for Development and Mr Omoshalewa Sholola – Director of Finance, at the recent internal evaluation of the project conducted on Tuesday 21,April, 2015. Dr Sanginga said he was delighted that the project was on track, and of the achievements so far recorded since its inception in 2012. “I am quite impressed by what you have achieved so far in terms of new varietal commodities, technology disseminated, value addition to commodities and how they are changing lives, generating income and employment for the people,” he said. The evaluation was conducted, according to the Director General, in order to have an update of the progress the SARD-SC project was making in the areas of technology dissemination, preparation for the Mid Term Review (MTR), and financial standing of the project and to discuss possible solutions to any implementation challenges. The DG said: “ The SARD-SC project is very important, not because it has a huge budget but in terms of the impact it is designed to have on the productivity of and income from the value chains of the commodities you work with and the lives of the people. This is a project which allows us to assess the impact of some of our mandate crops –Cassava, rice, maize and wheat- and in places it is executed. It is one project that helps to maintain strong IITA relationships with the AFDB. The evaluation exercise started with Dr. Chrys Akem, Project Coordinator, presenting an overview of the activities and achievements of the project on cassava, maize, rice and wheat value chains. He went on to highlight their impacts on the livelihoods of many in the project target countries. His presentation also highlighted new varietal development of the 4 target commodities and their dissemination to farmers and farmer groups. He also spoke of the project’s distribution of better quality cassava stems to farmers, improvements in mechanization of production systems for all the commodities, and infrastructural development with the building of cassava processing centers in DR Congo, Tanzania, Zambia and Sierra Leone. He pointed out how the establishment of these processing centers has led to new products development (confectionery baked with cassava flour) hitherto unknown in some of these countries. Consequently, it has fostered a strong sense of community engagement for all in the communities, especially the women populace. Included in his presentation was an update on the procurement and financial status of the project. Dr. Akem intimated the management that the project activities have been aligned with IITA Refreshed Strategy in the areas of: Increase food security and availability; Increased profitability of food products and Sustainability of natural resource management. It was not all a rosy picture for the project, as he revealed some of the challenges the Project Management Unit contends with in areas of procurement and financial disbursement, while also pointing out the opportunities that the project has going forward as it takes on its MTR review. The DG commended Dr. Akem for “a very comprehensive presentation.” He urged the project team to ensure they used the forth coming MTR as an opportunity to input their recommendations into the Bank’s final documents. Thereafter, members of the management team took turns at making comments and asking pertinent questions for clarifications from the project coordinator and members of his team on seemingly grey areas of the presentation. Mr. Sholola commended the team for effective financial management and controls while Mr. Akuffo – Akotto advised the project team to ensure the sustainability of the structures built in the SARD-SC project areas. Dr Hillbur encouraged the project team to continue with strong linkages with other institutional projects.